Miraculous: Tales of Ladybug and Cat Noir is a superhero TV series on Nickelodeon (Fun fact: it's a French cartoon but came to the US not long after its release). The idea for the series started as a 2D animation project aimed at young adults but later became a CGI cartoon series geared towards the younger audience. Regardless, it still caught the attention of the older crowd, probably because, as the catchy theme song states, Miraculous is simply the best! Below, I've listed a few reasons why you should check it out. 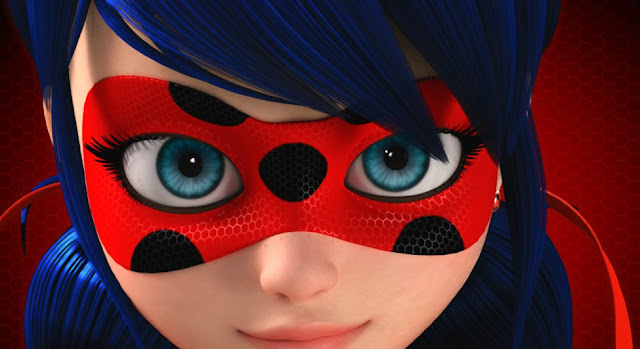 Where some children's shows fail to instill the joy of innovation and critical thinking, Miraculous Ladybug succeeds in promoting creativity and problem solving, especially when Ladybug is on the scene. By using Lucky Charm via her yo-yo (you read that right, but stay with me) she’s able to pull a seemingly random object from thin air to aid in defeating bad guys. These items range from bath towels to oven mitts to wrenches that, at first, seem hopelessly useless, until Ladybug takes a look around and uses her surroundings to her advantage. This isn’t just luck, ladies and gentleman, Ladybug has some serious creative skill and an ability to think on her feet. Besides, it's extremely important that we have a strong female lead who is capable of coming up with well thought out plans. She's an excellent role model to all young ladies. 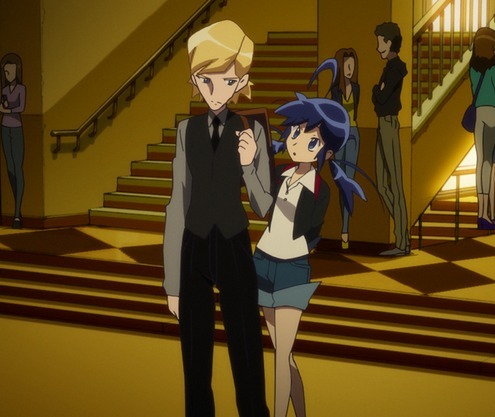 I am a huge 2D animation enthusiast, so it comes as a surprise to me that I adore the show's 3D look. As mentioned, it was originally supposed to be hand drawn but was later developed using CGI. Surprisingly, the art style is just as stunning. I can’t help but gawk at the sweet, sweet character design, setting, and attention to detail. And you can clearly see how anime has influenced the series in both the 2D and 3D animation styles. The fight scenes are incredible too! But also, the character’s expressions are beyond fantastic. That's right! 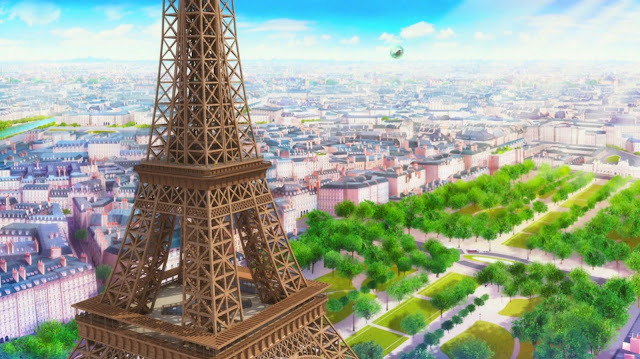 Miraculous Ladybug takes place in Paris, France and the show does the city justice. It even reflects Paris’ diverse population. Heck, the main character is half Chinese, half French, and her best friend is Caribbean, not to mention that the rest of the cast is diverse as well. While the characters fight crime in the City of Lights, the audience gets a front row seat to well known attractions such as the Louvre and the Eiffel Tower. It’s refreshing not to have the story take place in America (Let's take a break from New York and LA) and instead focus its attention on Europe for a change. The nods to Parisian culture are a nice touch. I enjoyed watching Marinette share a macaroon with Alya or witnessing Plaggs’ obsession with camembert (stinky, gooey, unpasteurized and absolutely, positively French...you know, when I visited Paris, this was actually my favorite cheese). The side characters are fresh, distinct, and fun to meet, and the magical sidekicks are utterly adorable and actually useful! In fact, these cute little guys are the ones who help our heroes transform into a crime fighting super duo. But Ladybug and Cat Noir steal the show. These two will be the death of me!! The interesting thing about these two is that their superhero selves retain their alter ego's personalities but with a twist. Marinette is clumsy and unsure of herself, but as Ladybug, her cleverness and confidence shine through. And though Adrien is reserved and innocent, as Cat Noir, these qualities are tweaked so that he's much more outgoing, open, and even cocky. The characters' alter egos are kept secret, even from each another...which makes for an interesting situation. While Cat Noir is positively smitten with Ladybug (flirts with her on multiple occasions) but she could care less for the guy's advances. 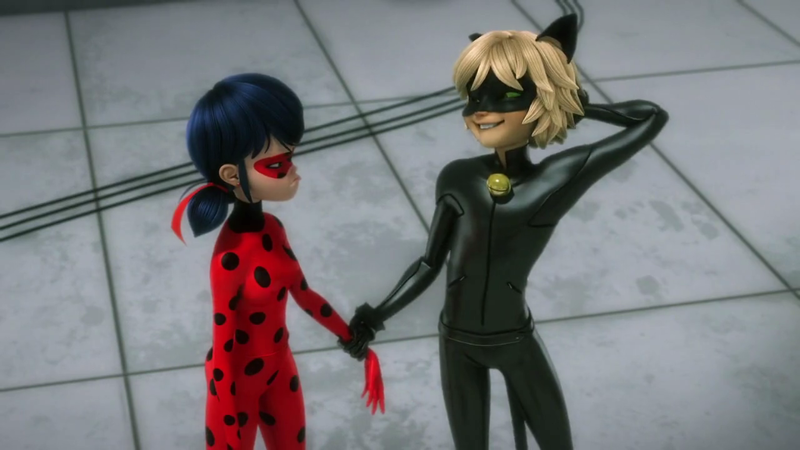 In fact, it's fun to see how much an effect Ladybug has on Cat Noir, making for a nice contrast to Marinette's relationship (or lack thereof) with Adrien. But when it comes down to it, they're the perfect team! Bonus: This show is puntastic!!!! Just...just watch this clip and you'll see what I'm talking about. If you spot the series at your local library or on TV and decide to give it a chance, I guarantee you'll find Miraculous to be the cat's meow. 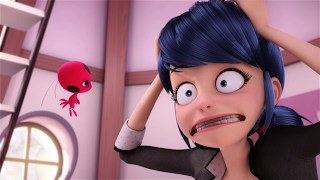 Have you seen Miraculous Ladybug? Let me know below.